Kevin Callahan at Moran Yacht & Ship tells me that his central listing, Palmer Johnson's 41.67 motor yacht Lady Jenn, has now been sold in an in-house deal, with Brian Moran acting for the buyer. Launched in 1994 by her original owner, she's been a popular charter superyacht in the Bahamas and Caribbean since launch and will again be available for charter after a refit by the new owner. 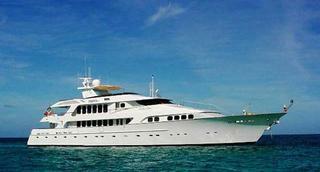 Lady Jenn can accommodate ten guests in five staterooms and features a large top deck with spacious sun pad. There's also an on deck master suite, large sky lounge, two VIP suites and a double and twin bedded cabin. Her asking price was $6.95 million.